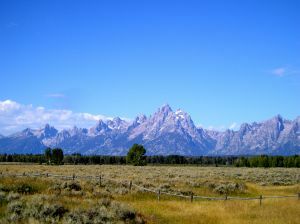 Wyoming is a state of the western United States. It was admitted as the 44th state in 1890. Acquired by the United States as part of the Louisiana Purchase (1803), Wyoming became a ranching center after the Union Pacific Railroad was established (1868). Cheyenne is the capital and the largest city. Population: 509,000. The area that would become Wyoming was inhabited by several Native American groups before the arrival of Europeans. The Shoshone, Arapaho, Cheyenne and Crow lived in the eastern portion of the area. They hunted bison, following the tremendous herds through their seasonal migrations, and lived in tepees. The Ute people inhabited Wyoming's western mountains, depending less on bison and more on the gathering of wild foods, the hunting of smaller game (antelope, rabbit, deer, elk) and fishing. The U.S. acquired the land comprising Wyoming from France as part of the Louisiana Purchase in 1803. John Colter, a fur-trapper, is the first white man known to have entered present Wyoming. In 1807 he explored the Yellowstone area and brought back news of its geysers and hot springs. Historians believe the first Europeans to see Wyoming were Francois and Louis Verendrye, who arrived in 1743, but it wasn't until 1807 that John Colter, who had been a member of the Lewis and Clark expedition, first explored the area that would become Yellowstone National Park. Fur trappers and traders followed, and by the 1840s, large numbers of westward-bound pioneers were trekking across Wyoming on their way to Utah, Oregon and California. This influx led to conflict with the Native Americans. In the late 1860s, the Union Pacific Railroad began stitching Wyoming to the rest of the country, and the population increased dramatically. By the 1870s, the Native Americans had been confined to reservations, which opened lands for the new settlers. Cattle ranchers began arriving in Wyoming (many of them having driven herds north from Texas), and they were later joined by sheep herders. Bitter and violent range wars ensued between the two groups, though cattle became the more vital business in the long run. Talk of statehood for Wyoming began as early as 1869 after the organization of Wyoming Territory in that year. The road to statehood, however, did not begin until 1888 when the Territorial Assembly sent Congress a petition for admission into the Union. Bills were introduced in both houses of Congress, but did not pass. Though no legislation passed Congress enabling Wyoming to follow the steps that lead to statehood, Governor Francis E. Warren and others decided to continue as if an "enabling act" had passed. On July 8, 1889, Wyoming Territory held an election of delegates to Wyoming's one and only Constitutional Convention. Forty-nine men gathered in Cheyenne during September, 1889, and wrote the constitution. The voters approved the document November 5, 1889, by a vote of 6,272 to 1,923. The Ninth Territorial Legislative Assembly authorized the construction of the building in 1886, and on May 18, 1887, the cornerstone was laid. Flagstone for the building's foundation was quarried near Fort Collins, Colorado, 45 miles south of Cheyenne, while sandstone from quarries near Rawlins, Wyoming, was used in the construction of the upper floors. Additional wings on each side of the original structure were completed in 1890 and the final two wings were finished in 1917. The interior is finished in cherry, oak and butternut woods. The original cost and the two later additions totaled $389,569.13. The murals in the Senate and House chambers were painted by Allen T. True. They depict industry, pioneer life, law and transportation. The ceiling of each chamber is stained glass with the State Seal in the center. Wyoming's license plates feature a man on a bucking bronco. The largest coal mine in the USA is Black Thunder located near Wright. The JCPenney stores were started in Kemmerer. The first Dude Ranch in Wyoming was the Eaton Ranch, near Wolf. The Eaton's also came up with the term "dude"
The Horse on the Wyoming license plate has a name, "Old Steamboat". It is named after a bronc that could not be ridden back in the oughts or the teens. Cody Wyoming is named after William "Buffalo Bill" Cody. The majority of Yellowstone Park lies within the boundaries of Wyoming. The Red Desert in south central Wyoming drains neither to the east nor to the west. The continental divide splits and goes around the desert on all sides leaving the basin without normal drainage. The Wind River actually changes its name in the middle of the stream becoming the Big Horn River at a site at the north end of the Wind River Canyon, where each year the Native Americans hold a ceremony depicting the "Wedding of the Waters."